The Scenes Contest allows you to add extra entertainment to your contests and to surprise the users with fun games and dynamics. 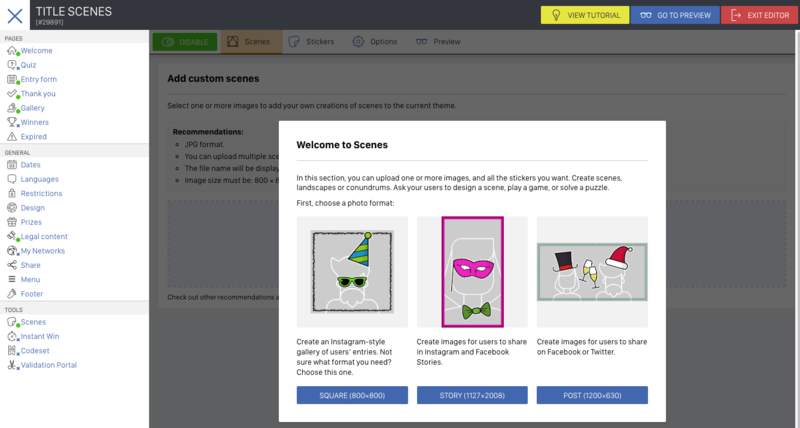 You can upload your own background images that will be the scenes where the users can play and bring their imagination to life: you can ask the participants to select a background (scene) and customize it with stickers. 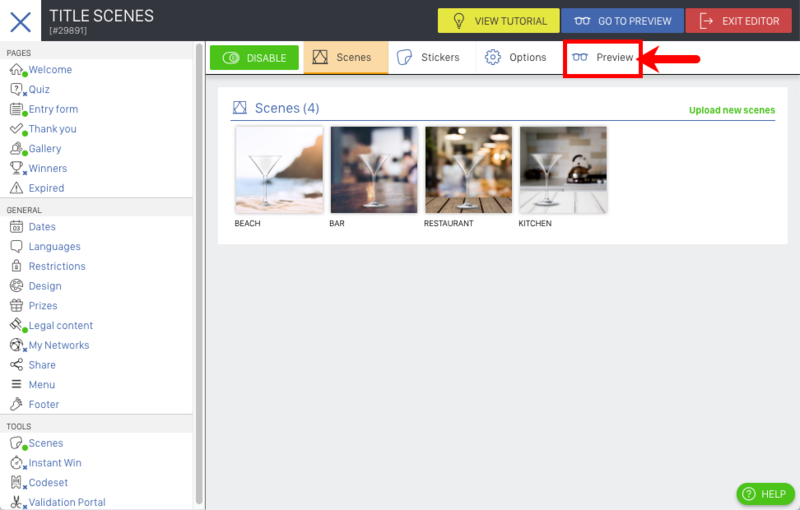 In this tutorial, we explain how to create a Scenes Contest where users can decorate a scene with the brand's own backgrounds and stickers. Note: The Scenes promotion is only available in White Label version. Do you want to try the user experience for yourself? Try our online DEMO and play with the Scenes feature to design your ideal drink. Don't miss out on the following steps and discover how you can create your own Scenes Contest. Note: You can upload more than one scene by selecting a folder. PNG image with transparent background. The name of the file will be the public name of the scene. The name of the file will be the public name of the sticker. Tip! You can add a white outline to the stickers to make them stand out more from the background. 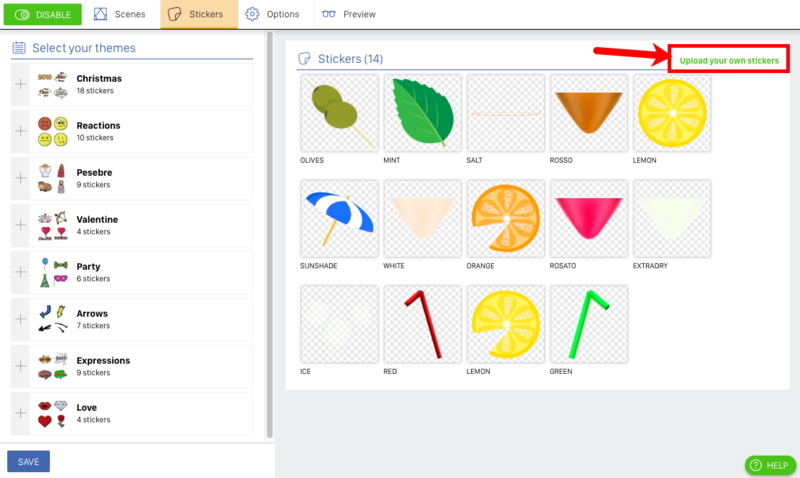 Reorder stickers: you can decide in what order you want to present the stickers to users. Modify the name of the stickers: if you decide to show the name of the stickers, you can modify the name because by default the name of the file is used. 1. Proportion: This shows the proportion of the image according to the format of the Scene that you selected when enabling the Scenes feature. You can change it here if you wish. 2. Button label: This is the text that shows on the button in the entry form of the contest where users click to go customize their scene. 4. Scaling mode: Here you can select if the users should be able to scale the stickers uniformly (the size of the entire sticker changes), or scale non uniformly (change the height without changing the width), or that is can't be scaled. 5. Display sticker and scene names: Here you select if you want the names of the scenes and stickers to be visible to the participants. 6. Load automatically when user goes to Entry Form. This option allows to open the Scenes tool automatically when you click on the "Participate" button of the promotion, even before the user completes the fields of the entry form. 7. Minimum and maximum number of stickers: Here you define the minimum and the maximum number of stickers the participants can use to customize their scene. You can use the Email Platform to send an email to each of the participants with the image of the scene they've created (in JPEG format), so they can download it, save it on their mobile, share it, send it to their friends, etc. Once you have enabled and configured the Scenes feature, the following step is to finish the configuration of the rest of the contest and the customization of all the pages of the promotion. To do this, you can follow the Photo Contest tutorial from Step 2. Do you want to see some more examples to get inspired to create your own Scenes Contest? Try our DEMOs that have all been created with our Scenes app.